My ultimate favorite show in the 80s! 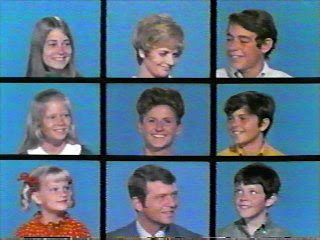 Reruns of The Brady Bunch, a tv series of the late 1960s and extending to mid 1970s, about two American families blending together. A widowed father of three boys marries a single (I'm not sure if she was a widow or a divorcee) mother of three girls. Sweet PG rated show. I remember I used to watch the show whenever I went on vacations. Even if it meant watching it in Spanish or French! Apparently the show was never aired in Kuwait! I'm not sure if it was even around in the 70s, but I'm guessing it wasn't since I never heard anyone following the show (at a time when TV was everything to us. How did we exist without internet!). Anyways, I was just watching E! The True Hollywood Story, and thought how ironic! The three Brady girls were at some point an item with the three Brady boys (the oldest boy, Greg with the oldest, Marcia, and so on). On the other hand, the only ones not falling in love in real life was Mr. Brady and Mrs. Brady! It turns out Mr. Brady was gay. They were not the perfect clean-cut family. The three 'D's' involved. Drugs, drinking, and depression! Well, even if you're beautiful, rich, and adored by millions you just can't have it all. Nobody's perfect.